Individual Didgeridoo Sound Therapy Entrainment’s are a powerful tool to help people through a variety of personal health and growth issues. The harmonic tones of the didgeridoo help people to release deep energetic and emotional stagnation that has collected throughout a person’s meridian system and energetic field. This stagnation can lead to both psychological and physical disease. Through the simple principles of *entrainment the didgeridoo acts as a tuning fork for a person removing energetic blockages and restoring their energetic field on a cellular level. The didgeridoo also produces a deep and effective source of natural infrasound. This infrasound penetrates deep into a persons muscular and skeletal system producing similar physiological effect as medical ultra sound therapy. Some of the reported effects of didgeridoo ultra sound have been relief of muscular pain, arthritis, osteo-arthritis, headache, migraine, accelerated bone growth along breaks and fractures. 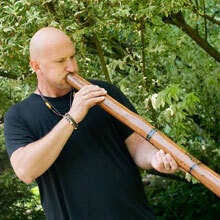 Didgeridoo Sound Therapy is also safe and effect for people who have metal implants. (*)Entrainment –The process by which the powerful rhythmic vibrations of one object are projected upon a second object with a similar frequency, thereby causing that object to vibrate in resonance with the first. – “The Healing Power of Sound”, Mitchell Gaynor, MD. 30 Minute Entrainment: This session provides an environment for the client to reach a deep meditative state where they can reconnect with their own self-healing abilities. During this session multiple didgeridoos are played over the clients chakra system and there corresponding meridian points to help clear stagnation. 1 Hour Entrainment: This session is recommended for clients clearing deep energetic stagnations that have manifested in the forms of with PTSD, Chronic Fatigue Fibromyalgia, Cancer and other related chronic illnesses. It can also be used for deep shamanic journeying and meditation. Please contact for more information.